A delegation of the Kashmir Press Conference, Srinagar, which included several leading newspaper men, met Quaid-i-Azam Muhammad Ali Jinnah, President of the Muslim League, at his appointed time, on 23 May 1944 at 11 a.m., at Koshik, Nishat, Srinagar, and asked various questions. Mr. M.A. 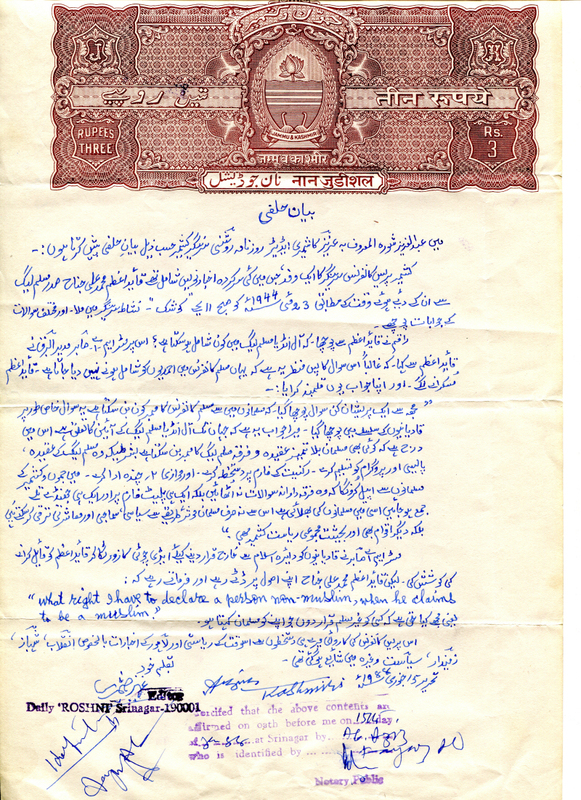 Sabir tried as hard as he could to persuade the Quaid-i-Azam to declare Qadianis as being out of the fold of Islam. But the Quaid-i-Azam stuck resolutely to his principle and kept on replying: What right I have to declare a person non-Muslim, when he claims to be a Muslim. The proceedings of this Press Conference were published, under my signature, in the Riyasati of that time and the Lahore newspapers, especially Inqilab, Shahbaz, Zamindar, Siyasat etc.